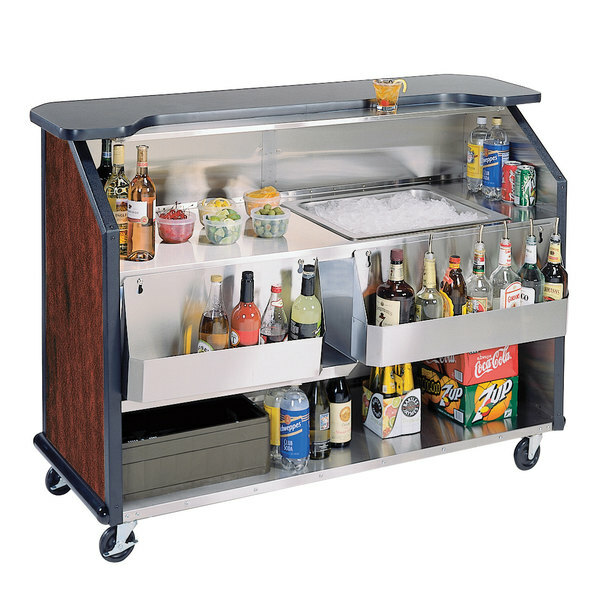 Take your bar service anywhere with this Lakeside 887 63 1/2" x 27 3/4" x 45" stainless steel portable bar with red maple laminate finish! Designed for easy drink preparation and serving, this portable bar comes with a 40 lb. ice bin with a drain and (2) removable 7-bottle speed rails, so you can keep the most popular syrups and liquors right at your fingertips. Featuring a 1 1/4" thick waterproof and stain-resistant black laminate top and a convenient, recessed stainless steel mixing shelf, this station is a bartender's dream! Located directly below the laminated top, this mixing shelf creates a row to lineup drinks and quickly add ice, garnishes, straws, and more. This differentiation also ensures guests do not grab drinks before they're ready to go, so you have happy customers and fewer spills! To complement the outstanding functionality of this bar, the front sides are also crafted from a seamless, elegant red maple laminate material. Thanks to its all-welded stainless steel interior, this portable bar does not retain odors from spills and is easy to wipe clean and sanitize. Four Lake-Glide® all-swivel 5" non-marking casters enable you to effortlessly reposition your bar for new events or thorough floor cleaning. When ready to lock the bar into position, flip down the two casters with brakes. Plus, its large bottom shelf is perfect for keeping your prep tools, ingredients, mixes, garnishes, ice, and glasses. It's also a private place to store staff's personal possessions or money boxes. This portable bar will make beverage service in your banquet hall, hotel lobby, outdoor wedding reception, or poolside terrace a breeze!